My little girl Sophia is almost five now and over the past few months, she has become My Little Pony crazy! Her must-have Christmas toys were all My Little Pony related and she was lucky enough to review the Magical Princess Twilight Sparkle and the castle last year, which she still plays with daily. She watches the film non-stop since it was recently realised on DVD, she knows every single ponies name by looking at their cutie mark (design on them) and she even sleeps in My Little Pony pyjamas with a My Little Pony Princess Twilight sparkle ted. So when a My Little Pony Equestrian girl doll arrived in the post last week, she was super-duper excited and could not wait to get it out the box and start playing. This is the first Equestrian girl doll that she owns, I did not even think she knew what they were but she clearly did. We were sent the Rainbow Dash doll, which looks very similar to the Rainbow Dash My Little Pony. There is a reason the Equestrian girls look familiar .... a magical mirror connects the world of My Little Pony to Canterlot high school. When Twilight Sparkle steps through the mirror, she discovers another world of friendship lessons where almost every pony she knows from Equestria has turned in to a teenage human, walking the school halls on 2 feet instead of 4 hooves! With My Little Pony Equestria Girls, the power of friendship makes anything possible! They are basically the doll version of the much-loved My Little Pony characters. 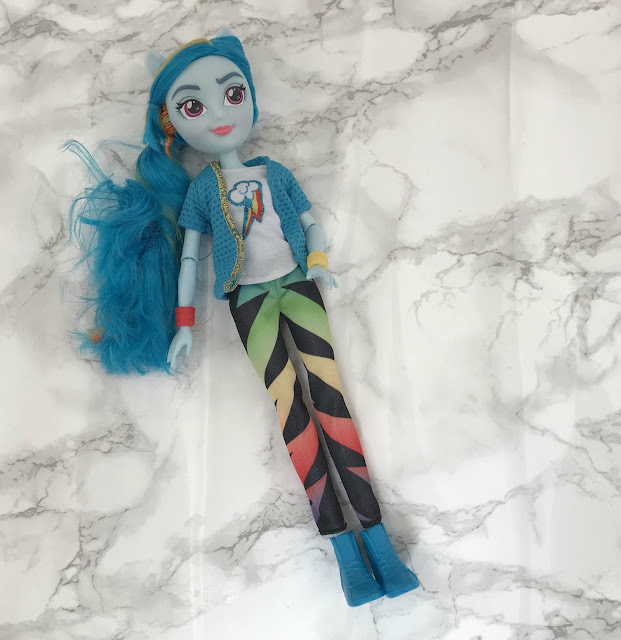 As we were sent Rainbow Dash, she was blue with rainbow hair, pony-shaped ears and was dressed in a colourful outfit of striped trousers, rainbow t-shirt and blue jacket. She is like a regular toy doll with posable arms and head. 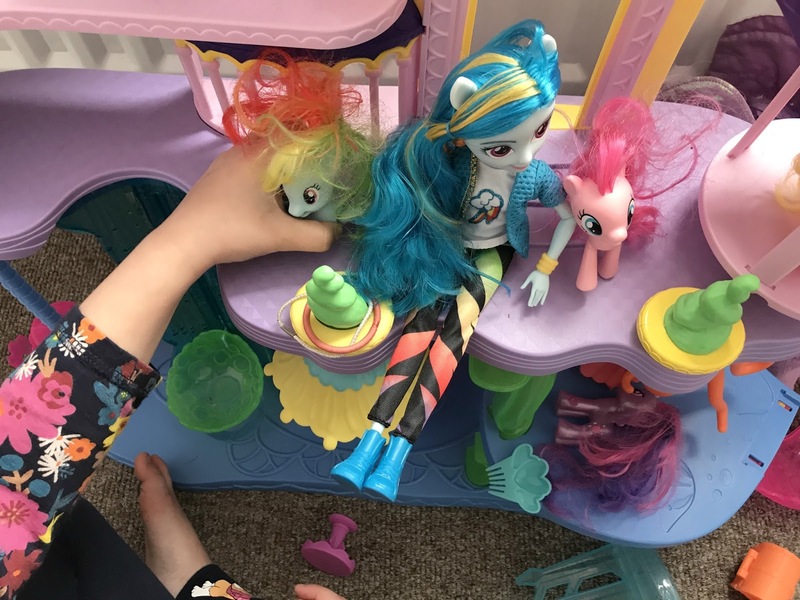 Sophia has had great fun playing with her new Rainbow Dash Equestrian Girl, she has been playing with her with her ponies making up great imaginative games. Now that she has one Equestrian Girl doll she naturally wants all of them to join her complete My Litte Pony collection. 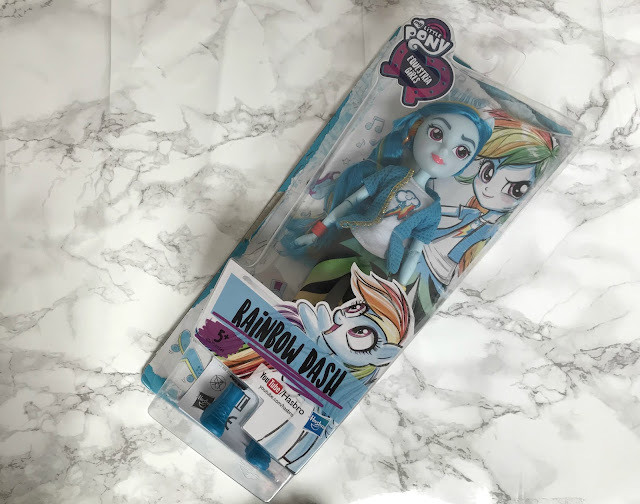 There are seven dolls in total to collect, Twilight Sparkle, Pinkie Pie, Fluttershy, Rarity, Apple Jack, Sunset Shimmer and of course Rainbow Dash. They are priced at £13.99 each and are available to buy from Smyths and leading toy retailers. Do your children like My Little Pony? Disclosure I was sent this doll for the purpose of this review, however, all opinions are my own.